Turkey will continue its economic relations with the European Union but will review all political and administrative ties, including the migrant deal, after the upcoming referendum on April 16, President Recep Tayyip Erdoğan said on Thursday. In an interview with broadcaster CNN Turk, Erdoğan said European countries were allowing events for those campaigning for a "no" vote while banning Turkish officials from rallying "yes" supporters. He accused Germany of supporting terrorism and said he had no plans to visit the country before the referendum. 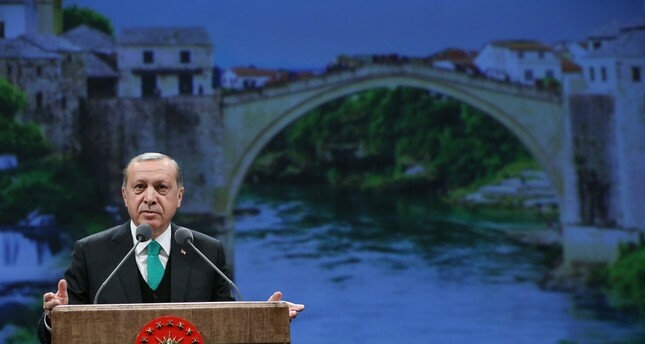 Erdoğan said European authorities violated the European values by banning Turkish officials from attending "yes" rallies while allowing events for those campaigning for a "no" vote. He stressed that the Turkey made great efforts to develop ties with the bloc and received nothing in return. "The real cause of the problems the EU facing right now is some member states' attitude,"
Erdoğan said a planned operation to drive Daesh from their Syrian stronghold of Raqqa, and the fate of the Syrian town of Manbij were "very important regional decisions we have to take," and said Turkey was saddened by the U.S. and Russian readiness to work with The PKK's Syrian offshoot the People's Protection Units (YPG) in Syria. The president also said U.S. and British ban on devices bigger than a cellphone in the cabin on flights from several countries including Turkey had damaged mutual confidence and said he hoped the mistake would be corrected soon. He said Turkish officials are in close contact with their American and British counterparts to reverse the decision of including Turkey to the list.